The zoo has you covered with the wildest weeks of programming available in Michigan! 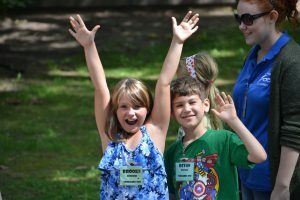 Each day of camp includes a variety of hands-on experiences, animal presentations, and adventures typical zoo visitors don’t have. We have another great camp season planned for 2019! 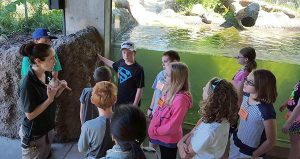 We will continue to offer both morning and afternoon sessions each week of Zookambi for kids entering grades 1-7, and two weeks of specially designed programs for students entering grades 8-12. We will again offer both morning and afternoon extended care. Check out the schedule and descriptions in the tabs below! Click here to register for Zookambi 2019! Membership saves you money, so if you aren’t already a member, join today! All of our programs run Monday through Friday. 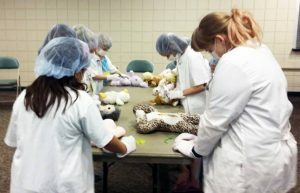 Zookambi kids can attend in the morning, afternoon, or all day! All sessions will have a snack provided. Morning classes are 9 a.m. to 12 p.m. Afternoon classes are 1 p.m. to 4 p.m.
Full day from 9 a.m. to 4 p.m.
Drop off times with no additional charge are 8:30 a.m. for morning sessions, and 12:45 p.m. for afternoon sessions. Pick up must be promptly at 12 p.m. or 4 p.m. Extended care is available for your convenience for a small additional fee. If your child is enrolled in both morning and afternoon classes, lunchtime supervision is provided by zoo staff. All you have to do is pack a lunch for your kids! Need a little extra time? No problem! We have early drop off and late pick up available. Campers can be dropped off as early as 7:30 AM and/or picked up as late as 6 p.m. The cost is $25 for morning or afternoon ($50 for both) per camper for the entire week. 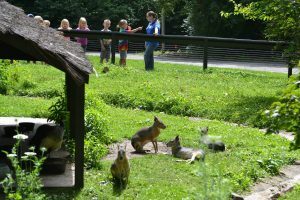 The Potter Park Zoological Society reserves the right to cancel a program due to low enrollment or unforeseen circumstances. Every effort will be made to contact students and refunds will be issued if this occurs. Anyone canceling more than 14 days prior to the first day of class will be able to apply their registration to another session of camp (if available) OR will be issued a refund, less a $20.00 processing fee. Anyone canceling less than 14 days prior to the first day of camp may apply their registration fee to another session of camp (if available) OR will be issued a refund of 50% of the registration fee. Cancellations less than 5 days prior to the first day of camp or no-shows are not eligible for a refund. Special arrangements may be made on a case by case basis if a child cannot attend due to illness or injury. Questions? Please call the education department at (517) 342-2713 or (517) 342-2769.